Environment Canada has issued a Special Weather Statement due to predicted strong winds from the southwest this afternoon and evening. Winds are expected to peak in the late afternoon and could remain near peak speeds into the early evening. Environment Canada’s Marine Forecast predicts sustained wind speeds on Lake Erie could reach 55 km/hr and the Special Weather Statement predicts gusts could reach up to 80 km/hr. The Marine Forecast predicts wave could reach 2 to 3 m in height early this evening. 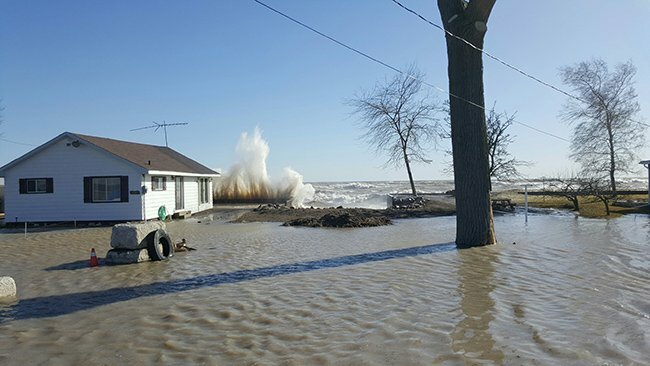 Last year flooding had occurred along Erie Shore Drive in Chatham-Kent when the area experienced sustained winds above 35 km/hr from a southerly direction (southeast through southwest). Therefore, the forecasted wind speeds and direction are expected to cause flooding in this area. There is also a risk that wave action could damage shoreline protection works and cause shoreline erosion in vulnerable areas. Residents along the Lake Erie shoreline should pay attention to local conditions.